Everyone is welcome! Just show up to shop. If you would like to get the latest insider scoop, sign up for the JBFVancouver, BC's newsletter! There are huge savings for families who love bargains! 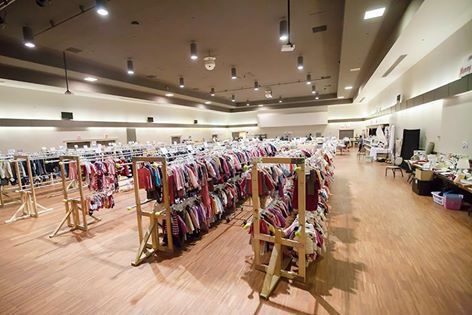 Items at the JBF sale are inspected for quality and priced 50%-90% off retail. Plus, most items go half price on the final day of the sale. 11:00am – 7pm Open to the Public, $6 admission (children under 18 free admission). Or Free Passes Here. 10am - 3pm Open to the Public, FREE admission. 50% Off Day, (items without a star are 50% off) today only. Consign / sell your items. Sign up, prepare your items, then drop them off at the sale. The bonus? Volunteer at least 4 hours. Our volunteers are the heart of our sales events. They facilitate importantl tasks such as set up, organizing the sales floor, check-out and break-down. The more you volunteer, the EARLIER YOU SHOP! Purchase a ticket and shop the sale before the public during pre-sale night. Sign up as a First Time Parent, Teacher or First Time Grandparent. If you are expecting your first child or have had your first child in the last 12 months, a teacher/educator or a first time grandparent you qualify! Remember to get your pre-sale pass here. Are you a leader or the head honcho of a parent group, social media group, parent of multiples group, school PAC or a blogger? By sharing the Vancouver JBF event through social media, email blast or however you connect with your group, we will give you a FREE pass to shop extra early on pre-sale day. Sign up! If you’ve never been to a JBF sale, here are some shopping tips to help you make the most of your experience! Bring a list. Prioritize what items you need so you don't miss it! maternity clothing over your shopping outfit. and during first hour of public shopping day.